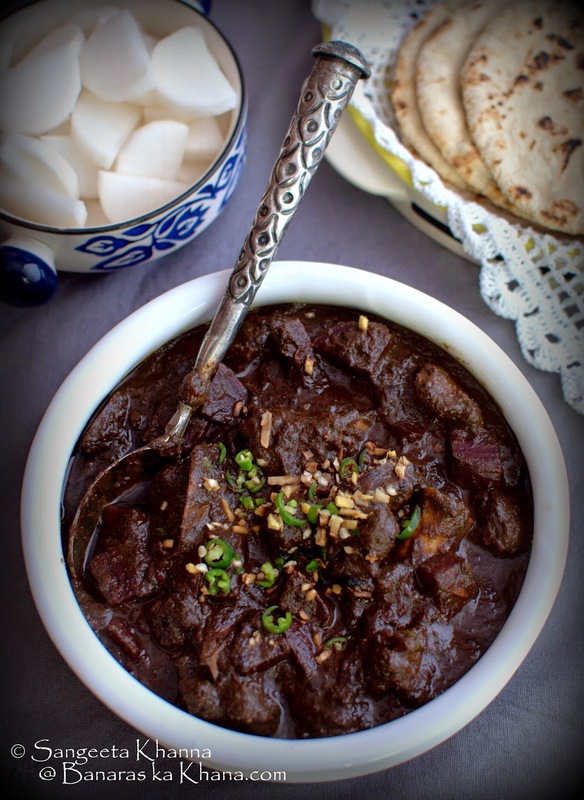 Chukandar gosht or mutton stewed with beet roots and leaves is one dish that looks really good on the table. Meats stewed slowly with vegetables is a Muslim way of cooking meats as much as I understand and that might be because it might have been the only way to eat vegetables in a primarily meat eating culture. I had never seen such meat stews being cooked in my family with added vegetables although spinach and fenugreek leaves were occasional additions to the meat curries cooked at home, sometimes a potato would be added for someone who doesn't like too much meat. Gobhi keema musallam and keema matar was common but any mushy vegetables were not at all considered for meat. I was a vegetarian back then. Later when I learned about shalgam gosht, arbi gosht and bhindi gosht etc being cooked regularly at some of my friends places, I figured that would be a better way to eat meats. Then I started adding one odd vegetable to the Indian style meat stews but was not confident with adding a strong tasting vegetable to the meats. Then I started cooking rajma with beetroots some 6-7 years ago and everyone used to love it although I am guilty of not sharing the recipe of that rajma too. Bringing beetroots to the meat stews was the next step and we loved this new avatar of Indian meat stew with beetroots and leaves. So much so whenever I find beets along with the greens attached, I think of a mutton stew. 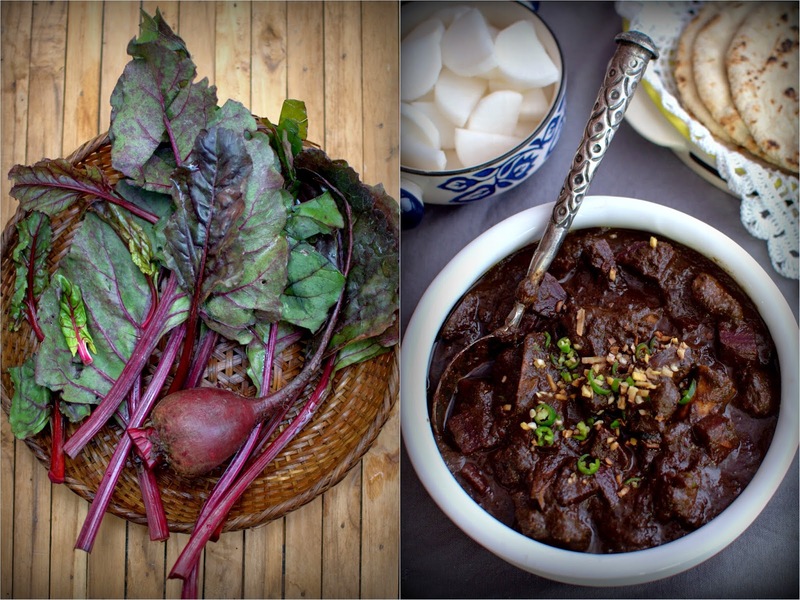 I sometimes cook this stew with just the leaves and sometimes add cubed beet roots as well. I must admit the version with just the leaves is appreciated more by majority of people I have come across. This recipe is not quick but is fairly simple to cook. 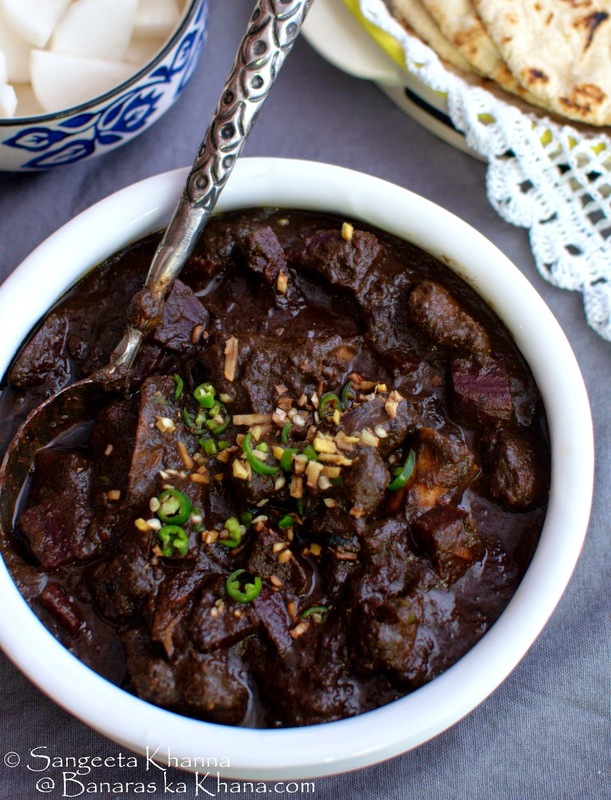 Cook this chukandar gosht when you have more work to do in the kitchen and this stew keeps cooking on the sly. I had learnt this recipe long back reading some Pakistani blog written in a very casual way but it was so good after tweaking the spices to my taste that I kept repeating it and forgot where I picked up. Rinse, clean and chop the beet leaves roughly. Peel, rinse and dice the beetroots. Keep aside. (You can choose not to add the beet root chunks if you think they will be too sweet for the stew. You would need to tone down the spices in that case). Put the mutton, beet leaves and tejpatta in a large stockpot along with a liter of water and cook on low flame for an hour or more, till the meat is cooked perfectly. Add salt after skimming any greyish matter that floats on the surface initially. You can pressure cook this mix in one step if you find it convenient. Once cooked, fish out all the mutton pieces, remove the tejpatta and liquidise the stock along with the cooked beet leaves. Keep aside. Heat mustard oil in a pan (preferably cast iron kadhai) and fry the sliced onions till browned well. Drain and make a paste along with the everyday curry powder and yogurt. Keep aside. In the remaining oil add the broken dry red chillies and let them sizzle for a while to release flavours into the oil. Now tip in the ginger garlic paste and fry till pinkish. Add the onion, yogurt paste and fry in low flame till it gets glazed well or releases oil (if using more oil). Add the cooked mutton pieces and bhuno till everything gets mixed well and the mutton pieces get a nice browning. Add the special garam masala, the beet root chunks and bhuno for 5-10 minutes. Add the pureed mix, some water if required and simmer till the beet root chunks are cooked well. This step can also be done in pressure cooker, being cautious of overcooking. Serve hot with chopped green chillies and ginger. It tastes great with khameeri roti or kulcha and some sirke wala pyaz or sliced mooli. Sometimes I cook mutton with spinach almost the same way, specially when the spinach is large and mature. This kind of masala suits well for added fibrous pureed leaves in the gravy. Basically a bit higher chilly and ginger heat to be toned down by the sweeter beets and yogurt. This curry has a unique taste that can convert beetroot haters. Some might not convert but most of them will for sure. 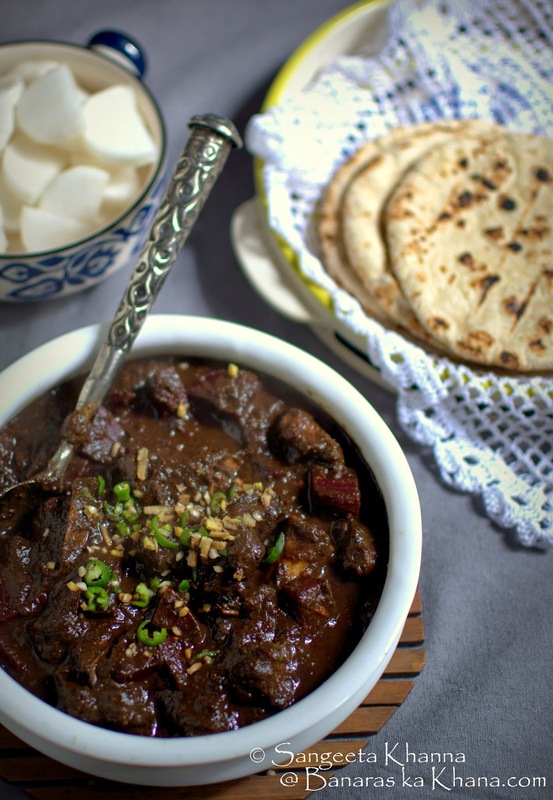 Please try this chukandar gosht and tell me if you like. Cook it with paneer or kala chana if you want a vegetarian version, you won't be disappointed. Wow!!!! That looks awesome. Superb! !